Ransomware, The Cyberthreat That Keeps On Growing #Infographic ~ Visualistan '+g+"
Ransomware is the cyberthreat that shows no signs of slowing down. 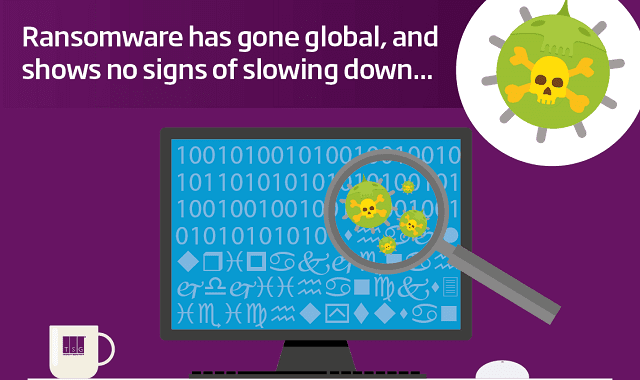 The malicious malware has seen a resurgence in recent years, with 2016 dubbed ‘the year of Ransomware’ and the worldwide WannaCry and Petya/NotPetya attacks in 2017 that brought Ransomware into the mainstream arguably for the first time. According to Heimdel Security, Ransomware could become more widespread than ever this year with the introduction of the General Data Protection Regulation (GDPR), which could see hackers holding businesses to ransom over the eye-watering fines of 2-4% of global business turnover for serious data breaches. This brand-new infographic by IT support provider TSG contains some key statistics on Ransomware that illustrate how ever-present the threat is, and some tips on how to avoid falling victim to this malicious malware, which encrypts a user’s – or even an entire system’s – files and demands payment for their decryption, usually in the form of cyber-currency Bitcoin.